CCC's Fable II Launch Site: Reviews, Previews, Cheats, Videos, Screenshots, and more! Are you wondering what the sequel will be like? Peter Molineux and Lionhead Studios promise to bring you a gaming experience you won't forget! Choices, consequences. 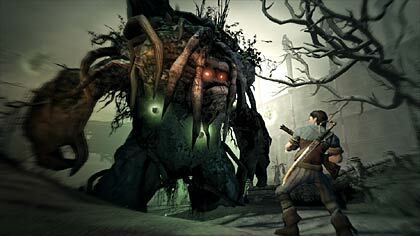 The innovative gameplay pioneered in the original Fable provided gamers with a never-before-seen level of immersion in a truly interactive world. A land far, far away. Revisit the sprawling world of Albion more than 500 years after the events of the original Fable, where you are free to explore the landscape and openly roam the countryside. Fight with ease. Fable II pioneers a new combat system designed to allow players to truly master hand weapons such as swords and maces, ranged combat weapons such as cross-bows and guns, and an entirely new magic system. A hero�s best friend. This groundbreaking addition to the game is integral to the theme of unconditional love in Fable II. The canine companion will act as friend, compass and protector. Ready to get the most out of Fable II? Don't forget to check out our cheats section, where you'll find cheats, tricks, hints, and everything you need to know about secrets and unlockables included in the game. Keep checking back for more!